1840 1d Mulready Letter Sheet, Forme 1, Stereo A9, addressed to Loughor and cancelled by a fine SWANSEA Maltese Cross in Red. 1723 Cover "To the Revd Dr Towers, Master of Christ College, Cambridge, showing a SUPERB ALBINO 'TENDY' (FOR TEMBY) - shows more clearly than our scan! - together with a London Bishop mark for 20/NO. 1785 Entire addressed to Rochdale, Lancashire with, on the front, a very fine straight line 54 x 7 mm WREXHAM, W 2401. 1800 Entire to Highworth, Wilts with, on the front, a straight line HAY, W 1115. 1859 1d Rose-Red, SG 40, tied to envelope from London to Bettws-y-Coed showing a fine MISSENT/TO/CORWEN. VERY SCARCE. 1841 1d Mulready Letter Sheet , Forme 1, Stereo A15. A very fine example to Chester cancelled by a fine MOLD MALTESE CROSS in black. 1798 Entire to Ross, Herefordshire with, on the reverse, a very fine circular BRECKNOCK/L in black. RARE SO FINE. 1844 1d Pink envelope to Wells cancelled by a very fine LLANELLY 469 numeral in Blue. Attractive. 1851 Entire from Bradford, Yorks to Welshpool showing a very fine "MISSENT BARNSLEY". Scarce. 1913 "ss Geelong" Photo Postcard to Oxford franked by a GV 1d, SG 357, tied by a very fine CARDIFF/SP 12/13/SHIP LETTER circular datestamp, Robs S2. V E R Y R A R E.
1848 Entire from London to Aberystwyth showing a very fine manuscript "MISSENT to" followed by a SUPERB "CHELTENHAM/3" SKELETON DATESTAMP IN GREEN, GL 169. SUPERB AND VERY ATTRACTIVE. 1804 HIGH RATE ENTIRE FROM LONDON TO CHEPSTOW SHOWING MANUSCRIPT "1 OZ ¾" AND CHARGED "4/8", EIGHT TIMES THE "7D" SINGLE RATE!!!! 1934 Envelope addressed to Kingston, Surrey franked by a 1d, SG 419 and 1d, SG 420, both tied by very fine LONDON & HOLYHEAD T.P.O./NIGHT DOWN cds. 1853 1d Pink Postal Stationery Envelope from Newtown (Mont) addressed "Per Steamer via Southampton" to "Captain George Edward Herbert, 9th Bengal Light Cavalry, Muttra, India". AN EARLY USE OF STATIONERY TO OVERSEAS. 1795 Entire to London showing a VERY FINE CONCAVE KNIGHTON, Powys - first year of recorded use. 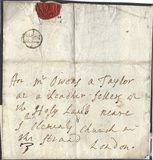 1694 Entire from Breconshire addressed "Ffor Mr Owens a Taylor/at a Leather Sellers at/the Holy Lane? neare/St Clements Church in/the Strand/London", showing a fine FE/12 London Bishop mark. 1887 5d DULL PURPLE & BLUE, SG 207, DIE 1. A very fine example tied to envelope to India by an ABERYSTWITH duplex. 1867 Envelope from Exeter to Haverfordwest via London showing a very fine PADDINGTON.STATION cds on the reverse. 1787 1 July Entire sent from Holywell to Rochdale with a black '200 HOLYWELL' mileage mark applied, W 1180. 1843 Entire to DOUGLAS, ISLE OF MAN showing a SUPERB ABERYSTWITH UNIFORM HANDSTRUCK "PAID/1d." IN RED. Superb! 1908 Postcard from Llandudno to Sale showing a very fine two-line POSTED ON/"LA MARGUERITE" cachet in Blue. 1913 Postcard from Llandudno showing a superb circular-framed "POSTED ON/LA MARGUERITE" cachet in Violet. 1926 Postcard from Liverpool to Manchester showing "POSTED/ON BOARD/ST. TUDNO" OVAL CACHET. VERY SCARCE - USED 1926 ONLY. 1912 Postcard to Liverpool from Llandudno showing a very fine CIRCULAR-FRAMED "POSTED ON x ST. ELVIES x" cachet in Violet. RARE. 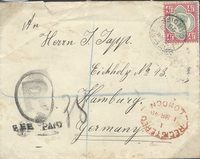 1898 4½d Green & Carmine, SG 206, tied to Registered envelope to Germany by a 'Bute St./Cardiff' cds. 1841 1d Red-Brown, SG 8, Plate 16, L-I. A very fine four-margin example tied to Cover to Monmouth by a fine DISTINCTIVE WOTTON-UNDER-EDGE Maltese Cross. RPS CERTIFICATE. Cat £20,000. 1872 Union Bank of Manchester "Sloper" Clip Postcard to Carnarvon cancelled on arrival by a Carnarvon duplex. Unusual. 1858 1d Rose-Reds, SG 40, tied to envelope by very fine WREXHAM Spoon duplex. 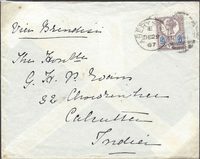 1872 Envelope to York franked by a 1d Rose-Red, SG 43, Plate 152 and tied by a fine Whitland-R.S.O. 'F24' duplex. Scarce. 1858 1d Rose-Red, SG 40, tied to Envelope by a very fine NARBERTH CIRCULAR DATESTAMP. 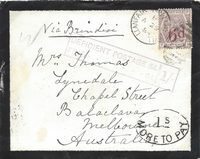 1909 SWANSEA/SHIP LETTER, Robs S6. VERY SCARCE. Carried on the Lusitania which called at Fishguard on its way to Liverpool. On board mail was taken to Swansea to be processed as Ship Mail. 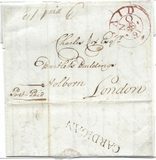 1820 Cover to Kent Road redirected to Briton Ferry, Neath showing very fine GREENWICH FLAT TOP '3', L 620, and a very fine framed POSTAGE NOT PAID/TO LONDON, L271, in black. 1913 Postcard from Llandudno to Grimsby showing a very double circular-framed POSTED ON LA MARGUERITE Steamer cachet in Violet, together with an unused card of the Steamer. 1904 Postcard postmarked LLANDUDNO, addressed to Warcop, showing a very fine POSTED ON/"LA MARGUERITE" Steamer cachet in black. 1830 Entire from Philip Thomas, New Bridge Works in Merthertidvil, to Edinburgh. Content is regarding the building of Bridges including CLIFTON BRIDGE. Also "MR BRUNELL's PLANS ARE MUCH APPROVED". 1824 Cover to MONMOUTH from STEYNING via London showing "MISSENT TO/CHICHESTER.